Who is the best detective? 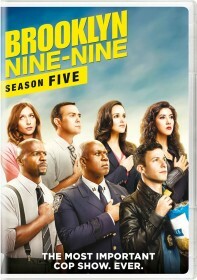 FOX has issued the press release for the October 10 episode of Brooklyn Nine-Nine, "Kicks". Jason Mantzoukas returns as Adrian Pimento in the episode. Now that he's officially back at the precinct and desperate to solve a real case, Jake finds a loophole to get out of his temporarily designated desk duty. Unfortunately, that loophole rests on his ability to pass an official evaluation performed by Holt. While Charles provides Jake with moral support, Terry and Amy help Rosa, who believes Pimento may be cheating on her in the all-new "Kicks" episode of BROOKLYN NINE-NINE airing Tuesday, Oct. 10 (9:30-10:00 PM ET/PT) on FOX. Now that he's officially back at the precinct and desperate to solve a real case, Jake finds a loophole to get out of his temporarily designated desk duty. Unfortunately, that loophole rests on his ability to pass an official evaluation performed by Holt. While Charles provides Jake with moral support, Terry and Amy help Rosa, who believes Pimento may be cheating on her.